Since, industrial age and the advent of modern era pollution has become a worrying factor of development. Besides other harmful byproduct of industrialization and advancement in technology, pollution and climate change is one of the most burning aspect of this progress. As human and other living organism are interdependent on its surroundings and environment, hence by all means change in environment concludes the effect on its inhabitants. There are many forms of pollution, but here we are going to discuss only “Causes and effects of noise pollution”. Where there is human there is noise pollution. Category of noise pollution varies from human talking to jet plane sound. However unbearable and excessive sound is in the list of noise or sound pollution. But the question is what the bearable sound volume is, and what is beyond the limit volume. Here 55 to 75 dB (decibel) is accepted standard of sound level for commercial as well as industrial areas. On the other hand this level is different for different age level. As WHO recommends less than 140 dB for children. More than this limit any of the sound is harmful and is termed as noise pollution. Several factors add sound pollution in our environment. It includes Industries, Transport vehicles, Construction machinery, and airports. In addition to this in residential areas, even sound of TV, Music players, Public address system and other gadgets when become unbearable and teasing of others is also a noise pollution. Pollution is not natural it is human made issue and human will solve it. Due to growing population cities, villages and industrial areas are now side by side. As a result industrial wastes and sound of industrial machinery is disturbing human life. Manufacture industry, steel mills, marble factories, and other industrial complex are major sources of sound pollution. Since machinery used in such factories is heavy, therefore they cause a lot of noise. And due to demand and market competition these factories work day and night and thus generate sound pollution round the clock. Such teasing and noisy environment badly affects workers as well as its surrounding population. The major cause of noise pollution in urban areas is traffic vehicles and construction machinery. With each passing day number of vehicles are increasing on the roads. This rapid increase is proportionally increasing noise pollution and air pollution. In addition to this road side, auto-workshops also add noise in the surroundings. Moreover construction machines, road drilling, and jet planes also create noise. On the other hand, excessive and un-necessary use of load speaker and public address on different occasion is also damaging smoothness of the environment. Loud sound coming from radio, TV and musical instruments is also adding fire. Noise pollution is causing great deal of problems for all living organisms. Where there will be more and more industry and metropolitan areas, there will be greater problem of noise pollution. As problem is created by man in and around its living and residential area, accordingly man is exposed to this more than anything else. Hence, human cannot be spared from this issue. Consistent exposure to noise and loud sound is affecting the human health badly. Research has shown that anger, tension, hypertension and fatigue are due to noise pollution. Moreover continuous exposure is retarding human brain and as result efficiency of the human brain is being badly affected. In addition to this, memory loss is also due to noise. Since memory loss and hypertension and great cause of Alzheimer so there is great need to curb this issues. It has been observed that dementia and Alzheimer are common diseases in modern cities. Excessive noise and prolonged exposure to sound can cause hearing loss. Loud sound damage ear drum and cause a disease tinnitus. Patient of tinnitus experience tin tin in their ear. Such hearing loss is usually irreparable. Hence, hearing loss is permanent. Noise pollution effects Children and old age group. In addition to this loud sound creates air embolism in ones lungs, which consequently travels to your heart and induce heart disease. Heart disease is common due to noise pollution in South Asian countries. Moreover, areas where war is ongoing also have high ratio of heart diseases due to noise pollution. International Labour Organization of UNO provides C 148 – Working Environment (Air Pollution, Noise and Vibration) Convention, 1977 (No. 148). This Convention concerning the protection of workers against occupational hazards in the Working Environment due to Air Pollution, Noise and Vibration. This has been implemented since 11 July, 1979. Moreover, USA Noise Control Act of 1972 also safeguards the environment against noise and unhealthy sounds. UNO members’ countries are bound to follow 1977 convention to stop noise pollution. As result similar legislation and regulations do exist in all most all members’ countries. Finally, question arises how to reduce noise pollution. 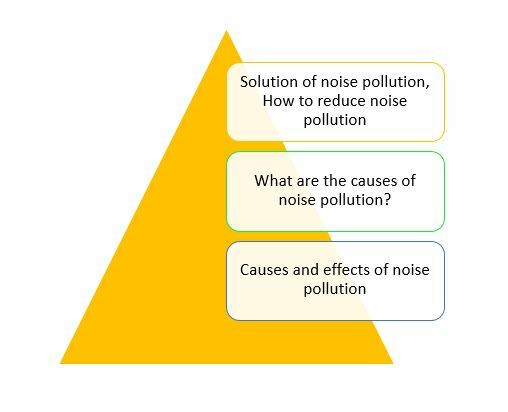 Fortunately, noise pollution is such form of pollution which on contrary to other forms not only can be minimized but we can reduce it to zero level. Legislation and environment friendly human habits are most effective ways to minimize this issue. Keep in mind convenience of other. Listen music at low level. Do not use loud horn. Adhere noise safety laws at work places. While arranging function and parties at home do not use loud speaker. However for public service loud speaker and other parties may be arranged with permission of authorities. Safety and care is basic principle to avoid any inconvenience and pollution. If not necessary stay away from noisy area. Use head phone while listening music instead of speaker.